Intel has announced its best financial quarter ever, with massive gains in all areas which following on from last year. Total revenue was $10.8 billion USD with a gross margin at 67 percent, an operating income of $4.0 billion - up 177 per cent from $1.7 billion and finally a net income of $2.9 billion, up 175 per cent from $1.0 billion. Intel claims the $10.8 billion figure is up 34 per cent year on year, although this time last year it was getting sued for £948 million by the European Commission. 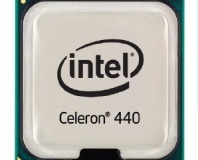 "Strong demand from corporate customers for our most advanced microprocessors helped Intel achieve the best quarter in the company's 42-year history," said Paul Otellini, Intel president and CEO. "Our process technology lead plus compelling architectural designs increasingly differentiate Intel-based products in the marketplace. The PC and server segments are healthy and the demand for leading-edge technology will continue to increase for the foreseeable future." Full information is available on Intel's website. Intel's CFO actually claims revenue was up 5 per cent sequentially, despite the seasonal norm of Q2 being 2 per cent down on Q1, and that globally the company performed better with average selling prices of CPUs increasing. With global IT markets apparently getting better and with corporate upgrade cycles in effect (moving from XP to Windows 7?) 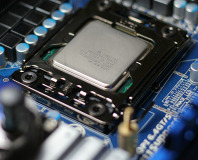 we'll also have to see if AMD benefits in the wave of new business, or if the market is just shifting towards Intel. Do you happily own Intel shares? Let us know your thoughts in the forums. 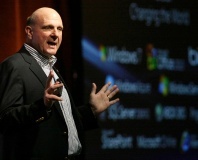 Microsoft CEO Steve Ballmer has confirmed that he is to sell a chunk of his stock in Microsoft.